Machu Picchu. Peru. The Inca Trail. These ruins inspire people to travel and hike great distances to view a wonder of the world, crossing high Andean passes to reach the mysterious Machu Picchu. Nothing can truly prepare anyone for the moment you first fix eyes on Machu Picchu, be it from the Sun Gate via the Inca Trail, or travelling up from Aguas Calientes. 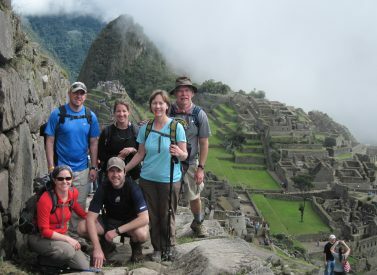 The number of visitors to Machu Picchu is limited to 2,500 people per day, and 500 souls (including porters and guides) on the Inca Trail – you must pre-book your entrance / Inca Trail trek to the site. Here we give an idea of a day at the ruins, and our own Machu Picchu highlights – check our Facebook photos and be inspired. How long do you get in Machu Picchu? Most guided tours last 2-3 hours and take in the most important sites at the ruins, be you with an Inca Trail or a guided tour from Aguas Calientes. The paths are good and either on original Inca paving or earth. Many of the ruins have been cleaned or rebuilt/restored, and are therefore in excellent condition. There are lots of steps up and down, so be prepared to climb and descend to visit some sites. Your trained guide leads you through the residential and ceremonial sections of this vast site, stopping to explain the latest theories on the part you are visiting. There is a great mix – from granite stores to the Temple of the Sun, some ruins hidden, some basking in sunny glory, such as the Room of the Three Windows, or the central plaza. The Watchman’s Hut usually makes for a good picture, as does the Inti Wasana stone, believed to have been an astronomic clock or a sacrificial area. Other recommended sites include the Inca Bridge – nice walk to it (30 mins) and not often taken. Inca Trail trekkers will have woken at 04.30 and hiked 90 minutes to get to the final pass at Intipunku (Sun Gate) from where the whole of Machu Picchu is spread out before you in all its glory – a fantastic sight for all. The Sun Gate is Alan’s favourite part of Machu Picchu. Inca Trailers leave the Sun Gate and walk down through the site to the main entrance where they can safely backpacks, use the toilet and have a drink in the snack bar just outside the entrance, and then on to their main tour. This is the mountain that appears in the background of the classic photo for this blog. If you wish to climb Huayna Picchu or Machu Picchu mountain, places now also have to be pre/booked and come at an additional cost, which we do at the time of booking if requested. This is Tom’s favourite part of the ruins, and he said: “I love Huayna Picchu. There are two departure times at 07.00 and 10.00 (permit required in advance, high demand, please ask), and it’s a steep one-hour climb (200m in height difference), much of which is up Inca stairs. Less popular and an equally beautiful walk is to the Temple of the Moon, accessed from the Huayna Picchu entry point. There is some high quality Inca stonework inside a cave, which was obviously a sacred place. This is on the west side of Huayna Picchu mountain, 400m below the summit of Huayna. Kathy’s top choice as it’s away from the crowds and to her the top spot from which to observe Machu Picchu. Machu Picchu mountain is just south of the main site, from the terraces where the Inca Trail enters Machu Picchu ruins. It is a 500m climb, up a well made Inca pathway, allow two hours each way, through lush forest, keeping a look out for interesting birds, flowers and snakes sunbathing on the path. Kathy said: “Machu Picchu mountain climb – for me it has the best views, it’s the remotest part of site and very few people go there. The ruins open at 06.00 and close at 17.00 every day, and are accessed by the Inca Trail or from Aguas Calientes, the town at the foot of the ruins. Getting in early is the key to avoid the crowds, or staying later in the afternoon after 15.00, when people descend to take trains to Cusco, or for lunch in Aguas Calientes. Kat’s favourite place is the Guardsman’s Hut, before or after the relatives hordes have gone. She said: “My favourite part was arriving in the early hours of the morning, off the Inca Trail and just being a little bit ahead of the crowds. “I’ve never seen a sunset there, but at that time of the day it’s magical anyway, when the day breaks and the hordes haven’t arrived just yet. Inca Trail hikers arrive 06.00 at Sun Gate, into the ruins themselves for about 07.00 and tour lasts until 09.00 (approx.). Descend to Aguas Calientes by 15.00 to catch the 16.00 train to Cusco, arriving Cusco 21.00 approx. People sleeping in Aguas Calientes can catch the first bus at 05.45 approx to get into the ruins for around 06.15 (recommended) before the Inca Trail trekkers arrive. It takes about 3-4 hours in total to travel the 70 miles from Cusco-Aguas Calientes, usually a mix of bus and train, or two hours from the Sacred Valley (Ollantaytambo) to Aguas Calientes. The bus from Aguas Calientes to the ruins takes about 20 minutes, and costs around USD 8 (2015 price) each way, tickets available before boarding. There are no ATMs in the ruins, and snacks are available from around USD 10 upwards from El Mirador snack bar, or from USD 25 or so for lunch at the Sanctuary Hotel. No other options are available, other than from Aguas Calientes itself. There are many restaurants in Aguas Calientes to satisfy all tastes and budgets. Of course you could also visit the hot springs that Aguas Calientes is named for, which will help ease those aching muscles. Entrance to the springs costs US$3 (2015 price), and you should allow a couple of hours to fully enjoy them. For the more adventurous you can climb Putucusi – no ticket needed, starts outside Machu Picchu site. Putucusi is the verdant rocky lump on the east side of the river, opposite Machu Picchu and is a challenging climb. Most of the ascent is up rickety wooden ladders, with short sections of path in between. It is not a good idea to attempt this if you suffer vertigo. The views from the top, of Machu Picchu and beyond to Salkantay are pretty spectacular, but be warned it’s a hot sweaty, slippery struggle to get there. A very simple and straight forward, yet very enjoyable walk is the walk along the river in Aguas Calientes. Keep your eyes open, as otters have been spotted here before! Your hotel receptionist can point you in the right direction and once you are the river, you just walk along from there. And last but not least – don’t forget you can soak your aching muscles at the Aguas Calientes hot springs in town. We had a great holiday, Great balance with activities and culture. With kids it is good that they don’t only need to see ruins and stones. Highlights were river rafting (canoeing), horse riding and 1-day inca trail with Machu Picchu visit. Great guides with a lot of knowledge, everything was very well organized and the drivers/guides always very punctual. Highlight is definitely the Galapagos. I loved the animals & their friendly nature, all of the trips & activities, the people & the guide was awesome. The fact that this part of our trip ran so smoothly & the accommodation was good particularly being so close to the sea. I would definitely recommend Andean Trails to others.